Google and Apple have built homes in the cloud for your photos, making it easier to sync and find them on all your devices and to tweak the ones that need retouching.Once you’ve backed up your photo library to the service, all your photos and videos, including any new ones you take, are synced among all of these devices automatically. In April 2015, Apple released Photos for iOS, Mac and the Web—a smart way to get us to pay for iCloud Drive storage. Then a couple of week later, Google dropped big news: Google’s Photos app for Android, iPhone and the Web would store all of your photos and videos free of charge. There are many other free cloud photo storage options despite similar names and talents, picking one isn’t as easy as you think. Sure, you could choose based on what devices you own and how much you are willing to pay for cloud storage. But even if you own an iPhone and money is no object, Google Photos is a better choice for all but serious photographers. It combines the company’s unmatched search smarts with everything I’ve ever wanted in a photo service, while making it incredibly fun to relive old memories. Here is a comparison of few very famous cloud picture storage options. 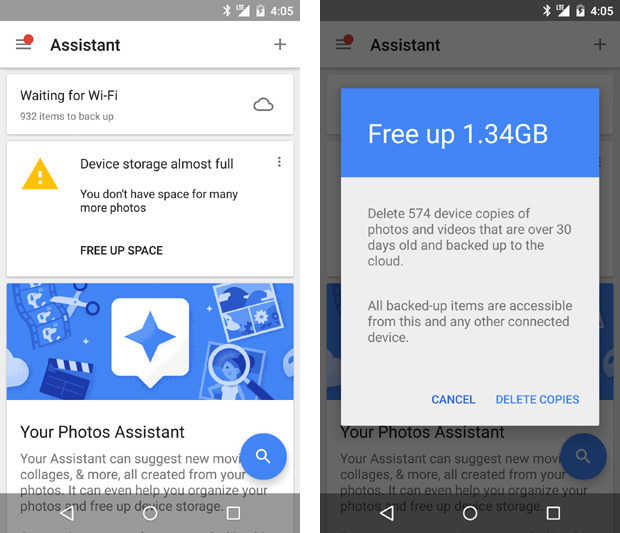 Google Photos gives your personal photos a comfy new home. Photos shared in Google+ remain part of your Google+ profile.It gave Photos users free, unlimited storage for pictures and videos at the highest resolutions used by average smartphone owners. If you have thousands of photos, it could take many days to upload them all—regardless of the service you choose and even if you have a fast broadband connection to the Internet. But like any free service, there’s a sacrifice in quality.Google compresses your images and downsizes any shots larger than 16 megapixels. I closely compared the original and compressed files, and though I could spot the differences when zoomed in, the compressed versions are still high quality enough for printing 8×10 photos or displaying on an HDTV. The services also compress video, and while files up to 1080p keep their original resolution, 4K or 5K video is downsized as well.So the maximum resolution of a picture you can keep as original without downsizing is 16 Megapixels and for video its 1080p which is the highest resolutions used by average smartphone owners. Google Photos does have an option to keep full-res images just as they came out of your DSLR camera but that’s counted against your limited storage of 15 GB for free account. If you want unlimited storage with full resolution it’ll just cost you. At the lower end, pricing is comparable: Google Drive costs $2 a month for 100GB and Apple’s iCloud Drive is $4 for 200GB. But if you’ve been shooting digital for a decade, you may need more capacity and that’s where Google beats Apple: $10 a month will get you 1TB from Google, but only 500GB from Apple. Apple’s first 5GB are free. In Google Photos, you will need to choose the storage type for your account as shown in the picture and in order to do that click on the menu on the top left corner and select settings. Here’s the most interesting story about Photos: It works like a face recognition system and assigns attributes to each photos in the library. Typing in “food” returns an embarrassing amount of food photos you may have taken over the years. “Holiday 2013” brings up shots from my trip to Bangkok that year. It really is as great—and highly surprising at times —as having your own personal Google Image Search. See that blue circular icon with a magnifying glass in your main photos list? Tap it. That icon takes you to Photos’ search screen, which holds some of the app’s coolest and most powerful features. Tap any of those faces, and you’ll see all of the photos – or at least many of them — in which that particular person appears. And here’s what’s crazy: Google says the app is able to track a person’s face and continue to recognize it as they age over time. So in theory, at least, the current photos of my daughter as an infant will one day be grouped together with photos of her as a young child, a teenager, and an adult. Google does it better. In fact, it’s jaw-droppingly good at recognizing faces. It identified my mom in a photo taken 30 years ago and another taken when she was only 10! Annoyingly, though, Google doesn’t yet let you assign names to faces. You just click on one face to see the other similar ones. The company says this has been a highly requested feature and, if added, it won’t tie face tagging to other Google accounts, a like in Facebook. In addition to People app on Android, Google Photos also lets you search your photo by Places and Things. Places uses location data to group photos so you can see photos of a trip you made without needing to first creating an album. More impressive is the things category which lets you search for photo of forests, food, stadiums, dancing and much more. Scroll down below the faces in that same search screen, and you’ll find a list of locations in which your photos have been taken. What’s particularly remarkable about this is that it works even if you don’t have location reporting activated. Google says its technology is able to recognize known geographical landmarks from photos and then use logic (and the laws of physics) to infer your location in other nearby photos. If you took a snapshot of the Eiffel Tower on February 9th at 2 p.m., for instance, Google can safely assume you were still in Paris in that selfie you took in front of a bakery 45 minutes later. The accuracy and level of detail may surprise you. This may be the most impressive part of the new Photos app: Beneath the locations in the search screen, you’ll see a list of common themes found in your photos — things like flowers, concerts, weddings, forests, nightclubs, and dancing. Tap any categorization, and you’ll find a selection of photos that matches that description. If you used Google+ Photos in the past, you might be wondering what happened to Auto Awesome — the fun set of collages, animations, and videos Google automatically generated based on your images. Don’t worry: They’re still here; they just have a new name. 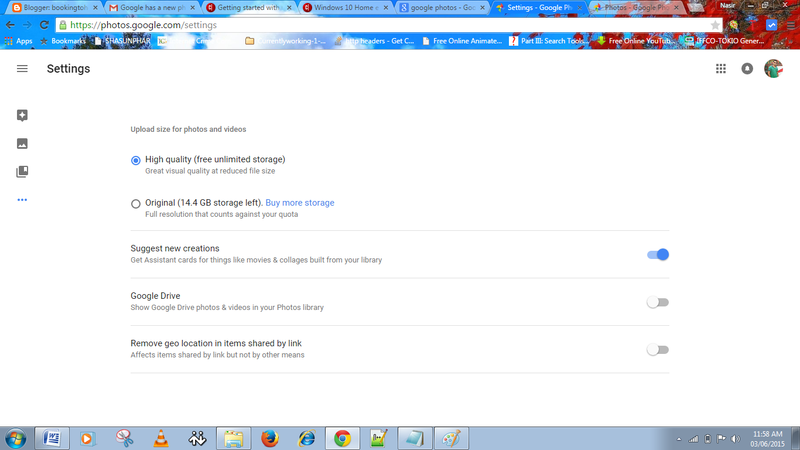 Scroll all the way down on the Photos search screen, and you’ll see an option called Creations. There, you’ll find all the different ways Google has mashed your photos together into interesting new forms. 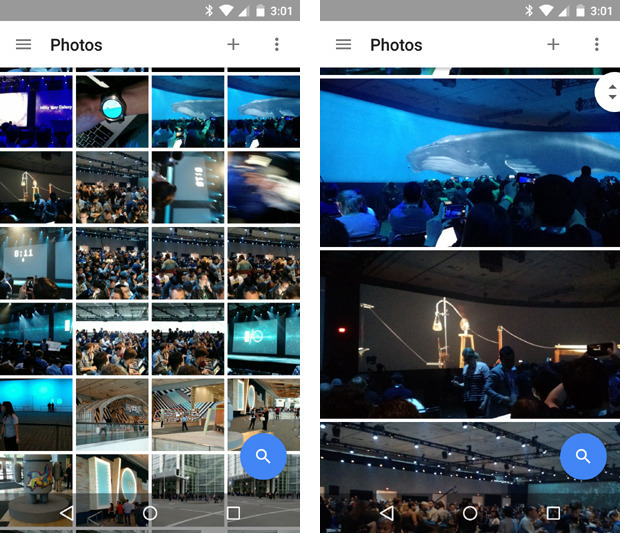 The Google Photos app will still make those mashups automatically, as the old app did in the past. But with the new app, you can also manually make any of those items anytime you want. To do so, just select any set of photos from your collection (more on the act of selecting in a second). Tap the “+” icon that appears in the upper-right corner of the screen, then choose from any of the options that appear — adding the images into a new album, movie, story, animation, or collage. You’ll be able to view and share the resulting creation seconds later. Your assistant shows you fun new things automatically created from your photos & helps you stay organized. if you have taken photos quickly in a motion and uploaded them all to the Google Photos it will automatically create an animation as shown in the picture below. Upload two or more photos to get a sweeping, perfectly stitched panorama. When you upload these pictures it will automatically turn into a perfectly stitched panorama as shown below. Manually selecting a bunch of items on a phone can be a pain — long-pressing one item, then tapping each additional item you want to be included one by one.The new Photos app has a better solution. While viewing images in the Photos app, long-press on any photo to start the selection process. Then, without lifting your finger, drag upward or downward. That’ll allow you to quickly select a bunch of consecutive photos without having to do the typical tap-tap-tap dance. When you want to select multiple pictures — say, for sharing or creating an album — you don’t have to tap on them one by one. You can just select the first one and then slide your finger to add others to the selection. Also, you can pinch and zoom to switch the view of your photo library from years to months to days.Google Photos has made this very convenient. One of Photos’ key features is the ability to automatically and continuously back up photos from your phone to the cloud for safe-keeping and universal access. Once a photo is backed up, then, there’s really no reason to also keep storing it locally and thus take up precious space on your phone or tablet. The new Photos app makes it easy as pie to free up space on your device by removing redundant local copies of images. There’s just one drawback: You have to choose to back up images at their full original resolution in order for the feature to be available. If you choose to use the free and unlimited “High quality” backup option, Photos won’t offer to delete local versions of images — since the local versions aren’t identical to those stored on Google’s servers. If you’re uploading at full resolution, look in the Assistant section of the new Photos app. When the local storage on your device gets low, you’ll see a card there showing exactly how much space you can free up by deleting local copies. You’ll also get a single-tap option to do the deed and remove all the local copies. It’s true: The free service of Google Photos uploads photos in “High Quality,” meaning that the images are compressed from their original resolution, provided said original resolution exceeds 16 megapixels. Rest assured that for most people, that’s just fine. iPhone photos and photos from small-ish point and shoots won’t suffer from a major loss of quality. Those shooting on DSLRs and higher quality cameras should note that the images won’t be stored in full resolution for free. However, you can choose to save the images in their original resolution to your Google Drive—it’ll just count against your Drive storage. The big picture? Google Photos may not be the perfect photo backup, storage, and sharing solution for everyone, but because of its ease of use, robust feature set, and surprisingly helpful Assistant tool, it’s going to be a great pick and a new standby for many—particularly those of us who have a hard time remembering to back up. 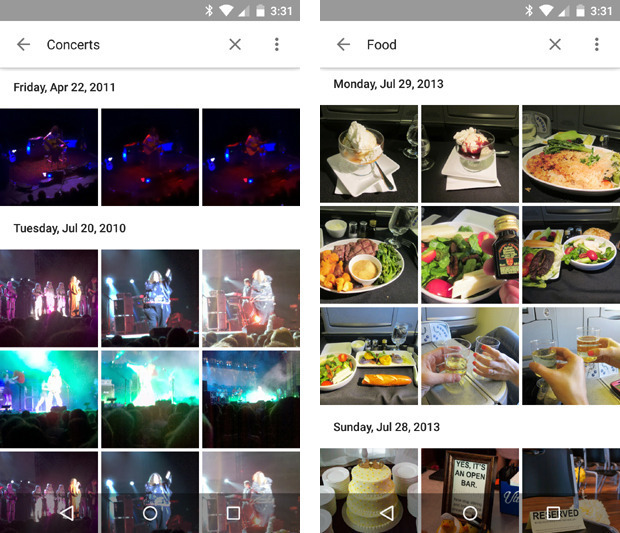 In many ways, Google Photos feels like everything we wanted iCloud to be. There are few things more precious on our phones than photos, and finally there’s a convenient place to keep them. 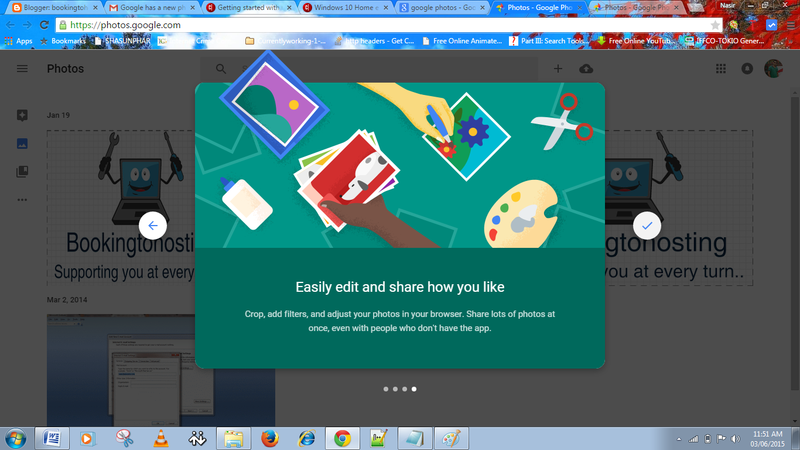 Google Photos makes the work of sharing your photos relatively quick and painless as well. Google Docs users will find the process familiar: Simply click on the “Share” icon and choose to upload to Google+, Facebook, or Twitter, or opt for a shareable link. 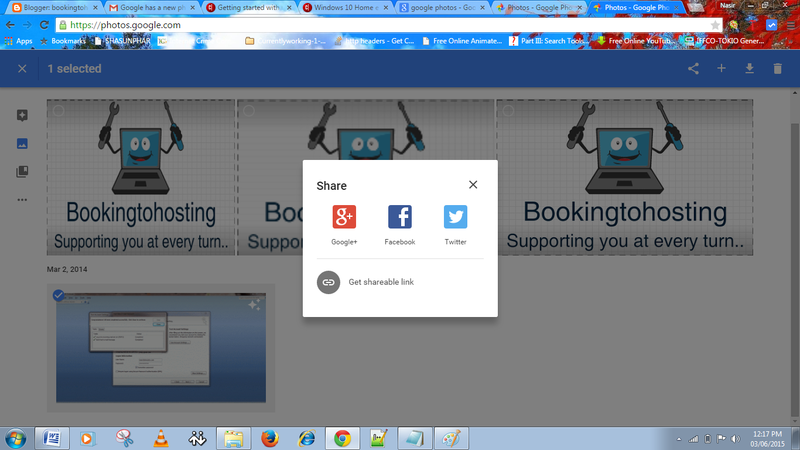 On the Google Photos’ Web app, click the share button at the top when you have a group of photo selected and click Get shareable link. On the iOS app, select your photos, tap the share button and then tap Copy Link to Clipboard. You will then be able to paste the link into an email, and your recipient will not need any special app or login to view your photos. Note:- To Download the Google Photos App go to https://photos.google.com/apps and to read more about it go to https://www.google.com/photos/about/.